Last week, shares of Axovant (NASDAQ:AXGT) rose almost 50% on the news that Dr. David Hung, former President and CEO of Medivation, was appointed as Axovant's new CEO. Dr. Hung rose to prominence not only for founding Medivation, but also for overseeing the company through to its $14 billion acquisition by Pfizer last year. This move likely has investors thinking Axovant may be about to meet a similar fate. Unfortunately, however, Axovant is no Medivation. Let's call a spade a spade here -- a fresh coat of paint won't make this outhouse a mansion. Axovant made headlines back in June of 2015 when its stock jumped 99% on its IPO day into what was then called the largest biotech IPO of all time, at a nearly $3 billion valuation. 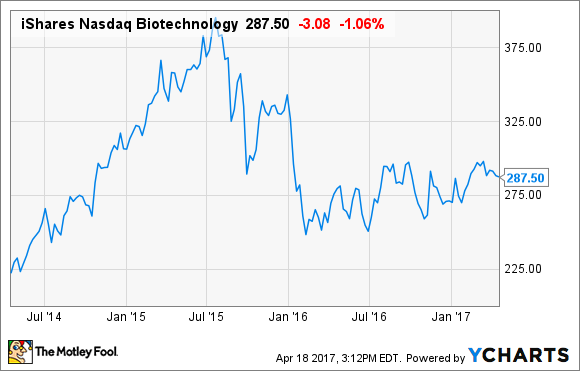 This move had multiple sources announcing biotech may be in "bubble territory" -- and we all know what happened soon after. But this isn't an article about the IBB; it's about Axovant, so let's back up a little. Axovant's main drug in development is RVT-101 (also known as intepirdine), an oral medication being developed for the treatment of Alzheimer's disease. RVT-101 is believed to work by increasing the release of acetylcholine, a chemical used by the neurons in the brain. Right off the bat, there are several factors that should make an investor think twice about investing in Axovant. The founder and previous CEO of Axovant is Vivek Ramaswamy, a former hedge fund manager who was 29 years old at the time of Axovant's IPO. And Ramaswamy, although he can list an undergraduate degree from Harvard and a law degree from Yale on his VC, has never before successfully brought a drug from development to commercialization. In addition, it is also important for investors to understand the history of RVT-101. RVT-101 was originally a product developed by GlaxoSmithKline, but was shelved after the drug failed four consecutive mid-stage studies as a treatment for Alzheimer's. Glaxo then sold the rights to this drug to Ramaswamy and Axovant for the paltry sum of $5 million with the potential for additional royalties down the line. Lastly, and potentially most troubling, the company lists Ramaswamy's mother and brother as the Vice President of Medical Affairs and the Vice President of Corporate Development for Axovant, respectively. In 2015, these two were granted stock options totaling 1,012,500 common shares. Over the past decade, 99.6% of Alzheimer's treatments have failed in clinical trials. I believe RVT-101 will be no different. RVT-101 is what is known as a 5-HT6 inhibitor. As mentioned earlier, this drug is believed to function by increasing the release of acetylcholine in the brain. While this sounds like it may work in theory, a Danish pharmaceutical company called Lundbeck previously pulled the plug on the development of its own 5-HT6 product after it failed in three consecutive clinical studies as treatment for Alzheimer's in 2015. While I can only speculate as to why Dr. Hung would choose to come aboard as the CEO of Axovant, the company raised $100 million in a secondary capital raise announced on the same day. Although I have the utmost respect for Dr. Hung, the news of his hiring does not change the fundamental thesis for this company. I would strongly caution investors to stay away from Axovant.